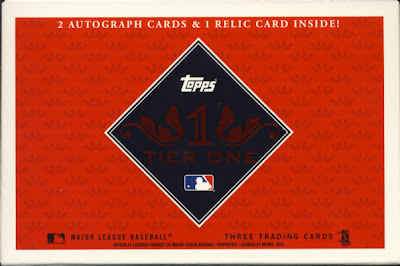 2012 Topps Tier One Baseball cards are booming with Bat Knob cards going for $1,000 and more. We realize not everyone will have the chance to open a box so I'm giving you the opportunity to open mine... virtually. To do this box break, click on the box which will open it. I've already taken off the celo wrapping for you because we all know how difficult it can be. You're welcome. Continue to click on the images to get through the entire break. Great Idea well done! Nice cards! Thanks, I really enjoyed that! That's a novel and fun way of sharing the experience of opening the box... When you watch a video, you're always aware that you're watching someone open their pack; this was like opening your own pack, even though it's not really. Hope you got your money's worth!